Going to Amsterdam for a few days for my 50th. A treat from my younger brother, all I have to pay for are my records. Speaking of which, are there any good places to pick up new release 45s/LPs there? Last time I was there a few years ago I visited Backbeat which used to be owned by the great Arthur Conley of course but I found it to be a bit pricey. Also any dedicated soul bars or clubs? We'll be going midweek, as that's my brother's regular days off work plus one holiday day he booked. Cheers. Just to add, I'm a fan of the vintage type stuff coming out nowadays and the last great album I bought was the Ben Pirani "How Do I Talk To My Brother". So anywhere selling stuff like that, thanks! we were at this gig in February...….. Thanks for the kind words. It was a fun night and really glad to hear you enjoyed it. 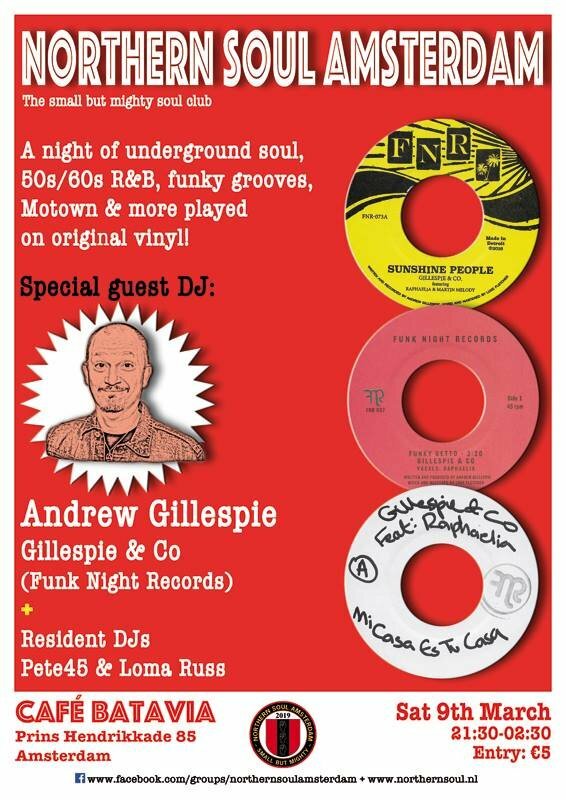 There is another Northern Soul event, organised by another promoter on Saturday 29th June. That's called Summer Soulful Saturday. Venue is De Nieuwe Anita. 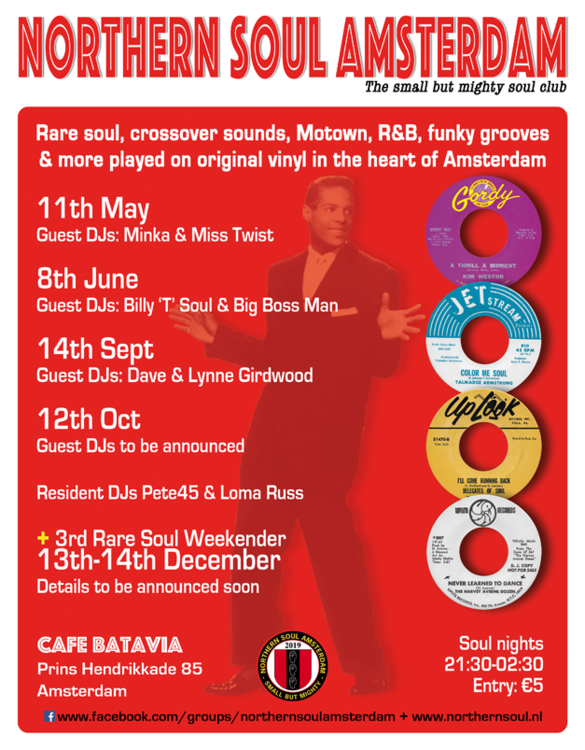 There are various soul/funk-type of nights here and there, but very little that's focused on the Northern stuff. As for record hunting, there are currently something like 30 shops in Amsterdam. The most obvious ones are Record Mania, Waxwell, Zap Records, City Records. The first one, Record Mania, has pricier stock in boxes behind the counter, so you need to ask to see those. And I'll warn you now that JM's price guide and Discogs prices are increasingly the standards used. That said, you can find stuff at good prices if you're either prepared to put the legwork in or are lucky - that, of course, is the same anywhere. If I can help further, just give me a shout. Thanks Russ - we'll be going on Wednesday morning, the 24th of this month and coming back on the Friday afternoon the 26th (my actual birthday). Last time I was there, Cafe Batavia near the Central station had some soul stuff as background music and the bitterballen were decent too, so might head there again. Not after expensive tunes, got about 250 euros to spend and want to get at least a handful of records for that. Will make a list of a few places, we're staying across from the station, not far from the aforementioned Cafe Batavia. To help you on your way when it comes to the digging part of your adventure, here’s a list of all the record shops here. The listing gives a broad indication of the genres you might expect in each shop, which will help narrow down your search.